The acoustic properties of our instruments can create a melodic, exotic, rhythmic, and international blend of various jazz styles. Larry Nobori (saxophone/clarinet), leads the group of professional musicians, whose backgrounds range from classical music to various jazz venues, and includes gypsy jazz and swing. Guitarist Larry Munson, who spent many years in Los Angles studios and taught at USC and other universities, plays acoustic and 7 string electric guitar. 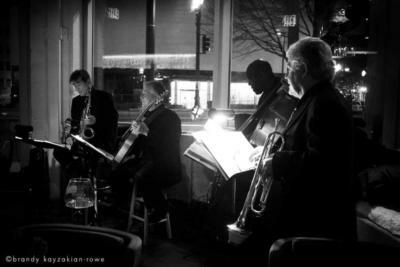 CAFÉ JAZZ began as a group over 5 years ago. 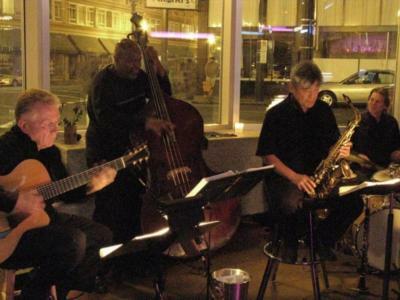 We have performed in several local Portland jazz venues, mainly at the Living Room Theater in downtown Portland. We continue to play there on a regular basis. Café Jazz is designed by a menu of different American, French, and Brazilian styles. Here are the styles of jazz we use, which we can blend together, or play separately. CLASSICAL DUO: Acoustic guitar and clarinet. A wide range of classical and baroque to jazz duos, for weddings and private parties. GROUPS: Café Jazz can be broken onto the following groups. Keep in mind that the size of the group may affect the cost. Quintet: Add drums for swing dancing and more rhythm. GYPSY JAZZ: Django Reinhardt, Stephane Grappelli, Dorado Schmitt, Sidney Bechet, Babik Reinhardt. AMERICAN SWING: Benny Goodman, Artie Shaw, Count Basie, Duke Ellington. BROADWAY: Cole Porter, Irving Berlin, George Gershwin, Richard Rodgers, Leonard Bernstein. JAZZ/BLUES: Bud Powell, Charlie Parker, Les Paul, Paquito D'Revira, Ken Peplowski, Anat Cohen, Benny Golson. Please note Cafe Jazz will also travel to Beaverton, Vancouver, Lake Oswego, Tigard, Marylhurst, Clackamas, Aloha, Fairview, Gladstone, Gresham, West Linn, Camas, Troutdale, Tualatin, Hillsboro, Oregon City, Brush Prairie, Boring, Sherwood, Saint John, Wilsonville, Heisson, North Plains, Ridgefield, Washougal, Battle Ground, Corbett, Canby, Cornelius, Scappoose.